The advantage of living in the highest hills is that there’s no one upstream from you. At the same time, hilltop dwellers may find it easy to forget what it’s like downstream. This lot sits at the head of a stream valley at the edge of a regional park. The large expanse of impermeable pavement collects rainwater, and the terrace above it discharges more runoff in a large drainpipe. Ordinarily the ground would absorb most of the water and release it gradually, the way that trees are used to. Instead the flow that results here is strong enough to carry away a lot of gravel. Oh well, call in another truckload. Turn around and track that water and gravel over the property line into the Regional Open Space. With the extra water, the stream is already cutting a deeper channel into its valley. As the years go by, the valley walls will slump into the stream and the trees will fall with them. A big wad of sediment now working its way downstream will clog the habitat below, smothering the bottomland and its ecosystem. Meanwhile the erosion of the stream valley will work its way headward. Eventually, within a lifetime, the spreading collapse will reach the edge of this large lot (and the neighbors’ lots) and whoever owns it will have an expensive problem. This pristine street may disappear from the map, like others before it in the Oakland hills. I’m not giving a professional opinion here; it’s obvious to common sense. The landscape of the hills is fragile, but expert advice can make living there much more sustainable. 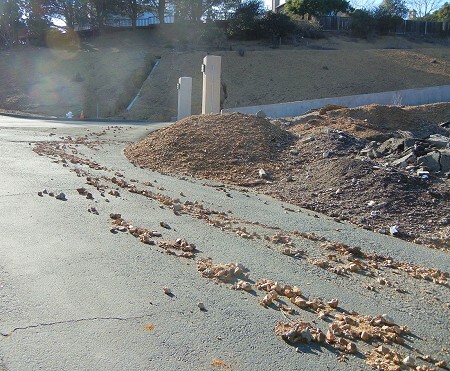 This entry was posted on 26 March 2013 at 5:11 pm and is filed under Oakland hazards, Oakland streams and water. You can follow any responses to this entry through the RSS 2.0 feed. You can skip to the end and leave a response. Pinging is currently not allowed. Thorougbly enjoyed your hazard talk.Only drove by the Mandela earthquake memorial. Your posts make me stop and look where I did not before. Ihave some geat rocks – East coast tho.Neer found conglomorate worth picking up. Wow, so cool you’re writing this, thank you. I guess the planning commission doesn’t have a geologist on it; otherwise they would be considering these erosion issues with new construction.